Students at Pope John/St. Boniface and Elgin Public Schools will benefit in different ways from generous donations made recently by Prairie Breeze Wind Energy LLC (PBWE). Recently, Prairie Breeze Wind Operations Manager Luke Hinkle made check presentations to the schools. Elgin Public and Pope John/St. Boniface were each presented checks for $5,000. 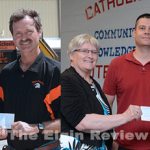 At Elgin Public, the donation is earmarked for the high school junior class trip which will take place in 2016. The presentation was made by Hinkle to District #18 School Board member Robert Hoefer on Friday, April 24. On Monday morning, May 4, Hinkle presented a check to PJCC/St. Boniface Principal Betty Getzfred and Technology Integration Coordinator Julie Dwyer. The donation is earmarked for technology improvements at the school. Read the complete story in this week’s issue of The Elgin Review.